We used Unity during the jam because it was something we all had experience with, but we've always found it tedious to build larger projects in it & so wanted to remake it in something more suitable. @DrMelon recommended we try Otter after he used it for a platformer project (https://www.youtube.com/watch?v=ZsvsH71JTkk). It was an easy switch over because we'd been writing in C# for Unity anyway, and allowed us to do a lot of more advanced stuff really easily (I especially like how easy it is to add screenshake). After using Otter I think it'll be my go-to prototyping engine for game jams and such. Me and my mates remade our original Unity Global Game Jam 2015 entry in Otter! The game is about being bad at magic. 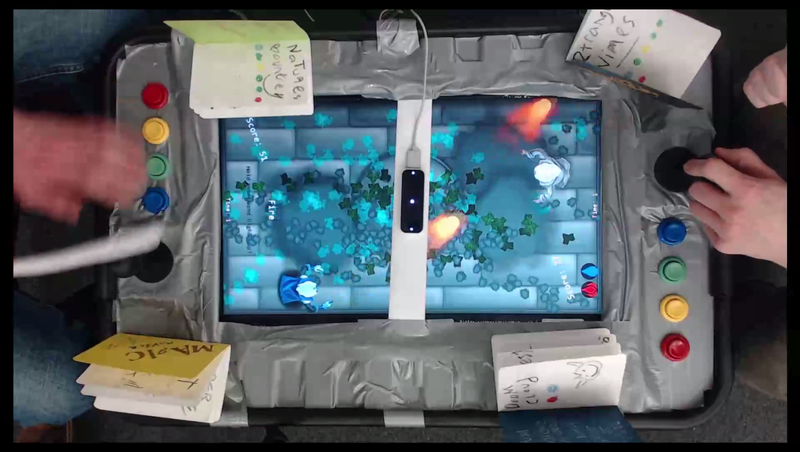 It combines physical and digital play; players have to look up the spell combinations in the spell books, enter them on the custom controller & then aim and cast using a Leap Motion Controller which is tracking the wands.